London Fashion Week might be over, but the look dominating the runway at major events is here to stay: the bushy brow. Leaded by the hottest model of the moment, Miss Cara Delevigne, who brought bushy back on trend since 2012, many girls have paraded the 80's bold brow at the latest fashion shows. 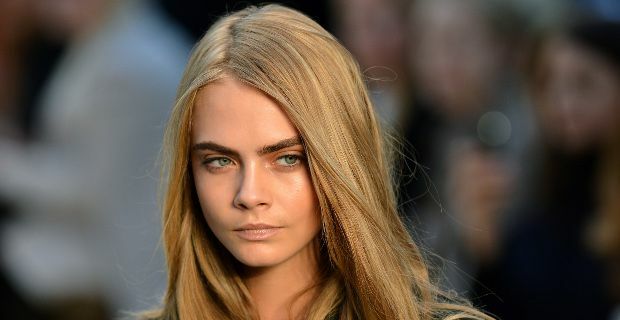 Many designers, like Christopher Kane, Burberry, Marc Jacobs and Stella McCartney have chosen the natural brow look for their catwalk shows, proving that thick brows are here to stay and thin ones are a thing of the past. However not everyone has been blessed with naturally luxuriant eyebrows and due to over-plucking a good portion of women ended up with sparse brows. Fortunately we found some products on the market that claims restoring and enhancing the appearance of eyebrows density in no time, in order to achieve the long-sought-after Delevigne look. Rapid Brow, Eyebrow Enhancing Serum, £37.00, is a brand-new product, which applied daily on your brows, promises to improve density by up to 108% after 60 days of usage. The serum nourishes the follicles and the hair structure thanks to a combination of fruit extracts, vitamins, proteins and amino acids, and without using any artificial growth component claims to repair and restore uneven eyebrows. Elizabeth Arden Prevage Clinical Lash and Brow Enhancing Serum, £85.00 is a non-prescription serum that gives both your eyebrows and lashes a thicker, lusher appearance. It contains a blend of vitamins A, C and E, botanical extracts, triple peptide complex and conditioners, which, used regularly, will improve the health of your brows, as well as minimising breakage and damage caused by environmental factors. Brow Enhancing Serum Advanced, Anastasia Beverly Hills, £38.00 is a growth stimulating serum, containing natural leaf extracts and pentapeptides that helps depleted brows to go back to their original healthy state. It can be applied twice a day, before putting the make-up on and after removing it, in order to maximise brows thickness and length.